The proud little town of Evora — set amid the cork groves of Portugal’s Alentejo region — boasts Roman ruins, a 12th-century cathedral, a laid-back local scene and hearty cuisine. From Romans to Moors to Portuguese kings, the proud little town of Evora — set amid the cork groves of Portugal’s Alentejo region — has a big history. 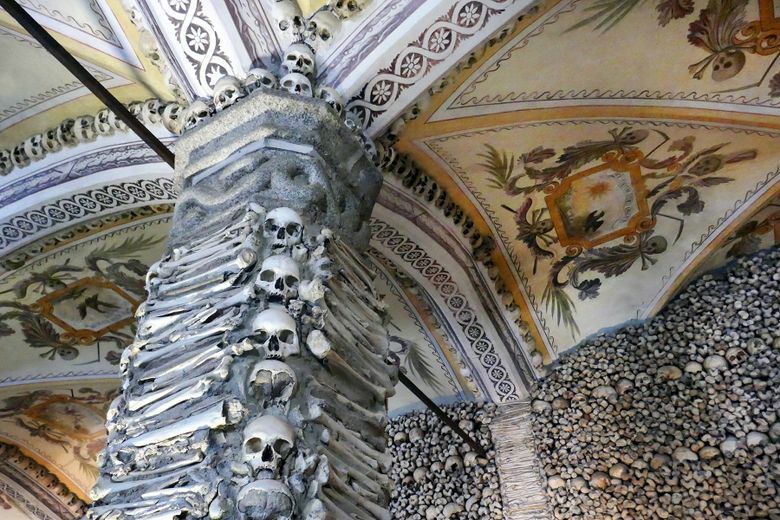 Just 90 minutes east of Lisbon, Evora has impressive sights — Roman ruins, a 12th-century cathedral, and a macabre chapel of bones — coupled with a laid-back local scene and a hearty cuisine that makes me think of Tuscany. From the second century B.C. to the fourth century A.D., Evora was a Roman town important for its wealth of wheat and silver, as well as its location on a trade route to Rome. From the eighth to the 12th century, the Moors ruled Evora. During its Renaissance glory years, Evora was favored by Portuguese kings, serving as the home of King Joao III, who presided over Portugal’s peak of power (and its first decline). Evora’s walled city is compact. The main sights cluster within a five-minute walk of the main square, Praca do Giraldo — named for Giraldo the Fearless, the Christian knight who led a surprise attack and retook Evora from the Moors in 1165. As thanks, Giraldo was made governor of the town and the symbol of the city. 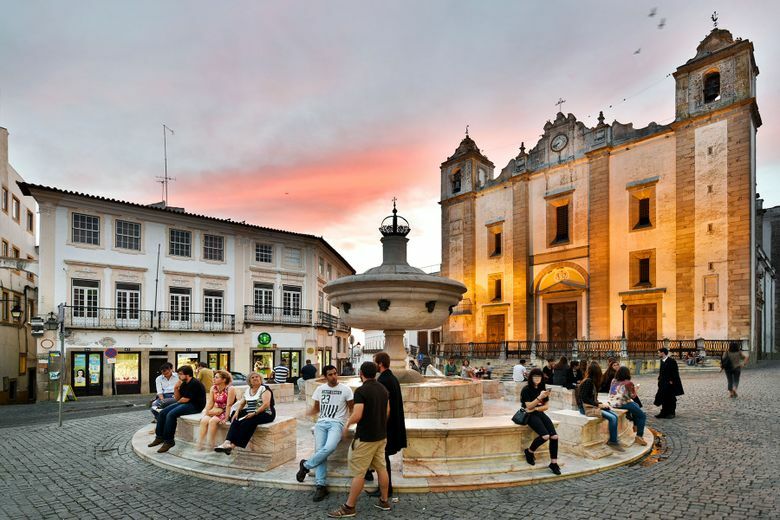 The square served as the town’s market during the Moorish period, and it remains a center of commerce for country folk who come to Evora for their weekly shopping. Radiating out from this town hub are traditionally decorated cobbled streets — centuries old and protected by law. The yellow trim on the buildings is common for this region and believed to repel evil spirits. Jacaranda trees — imported from South America 200 years ago — provide shade through the summer and purple flowers in the spring. Lining these streets are fine eateries and shops selling local products, including cork (everything from purses to postcards), tile, leather, ironwork, and Arraiolos rugs (handmade with a distinctive weave in a nearby town). As you wander, you’ll see several remnants of the Roman wall that once encircled the town. But the most intact Roman ruin is up a hill, at the town’s high point: 14 Corinthian columns, marking the Roman temple that once stood here. Today, open-air concerts and events are staged against this backdrop. The Museum of Evora stands where the Roman forum once sprawled. An excavated section of the forum is in the museum’s courtyard, surrounded by a delightful mix of Roman finds, medieval statuary, and 16th-century Portuguese, Flemish, Italian, and Spanish paintings. Also topping the hill is Evora’s cathedral — a transitional mix of Romanesque and Gothic styles, standing on the site of a former mosque. Inside the cathedral is a 15th-century painted marble statue of a pregnant Mary. Throughout Alentejo, people have a deeply felt affinity for this ready-to-produce-a-savior Mary. Across the aisle, a more realistic Renaissance Gabriel, added a century later, comes to tell Mary her baby won’t be just any child. For great views of the surrounding plains, head up to the church’s rooftop terrace. After meditating on mortality, it’s time to return to the land of the living. For a fine slice-of-life look at this community, head to the nearby farmers market, with a fragrant fish section, fresh produce, and good little eateries. Or you can pick up picnic food to eat in the pleasant public garden next to the church. If you want to try the locals’ favorite pastry, queijada (sweet cheese tart), you can buy them fresh from the kiosk cafe inside the park. While you can zip in and out of Evora on a day trip from Lisbon, I prefer to spend the night and savor dinner at one of the town’s fine restaurants. The Alentejo region has its own proud, rustic cuisine with lots of game and robust red wines. Linger over dinner, then, late in the evening, stroll the beautiful back streets and embrace the chance to just enjoy a ramshackle, workaday town in the countryside of Portugal. Sleeping: Pousada dos Lios (also called Pousada Convento de Evora) is a luxury hotel renting 36 small but well decorated rooms in a former monastery (splurge, www.pousadas.pt). Moov Hotel Evora is a great value, with 80 minimalist rooms in a residential area of the walled city (budget, www.hotelmoov.com). Eating: For decades, Restaurante O Fialho has dished out some of Evora’s finest local cuisine. It’s expensive, delicious and enjoyably pretentious (Travessa das Mascarenhas 16, tel. 351-266-703-079). Adega do Alentejano proudly serves traditional Alentejano dishes in a cozy space, with house wine poured from large earthenware vats (Rua Gabriel Victor do Monte Pereira 21A, tel. 351-266-744-447). Getting around: Evora’s main sights are located within the city walls — and the city center is easily walkable. For those arriving by car, a shuttle bus provides easy transport to and from parking lots beyond the center. Email Rick Steves at rick@ricksteves.com and follow his blog on Facebook.